YOUNG footballers and elderly care home residents covered almost 200 miles on exercise bikes as part of a charity cycling challenge in Chester le Street. Among the participants was 75-year-old Margaret Waggitt, a lifelong keen cyclist from Pelton Grange Care Home, Front Street. Margaret clocked up almost two miles in one sitting, followed by another three miles in just 15 minutes at the home’s summer fayre. Staff and visitors covered the remaining 180 miles in around 12 hours – the majority by the coach and players from the Birtley Town under 10s football team. 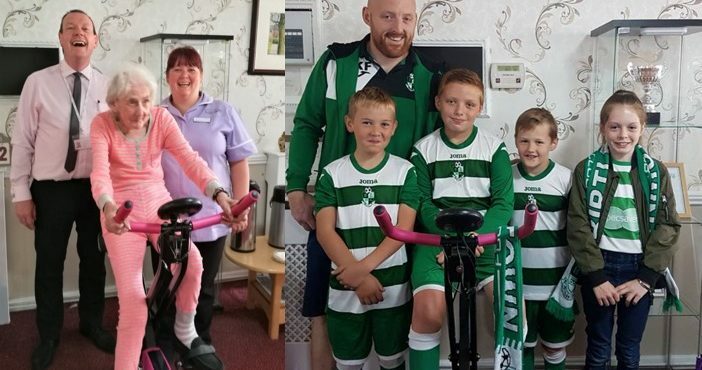 Lindsay Sale-Thorn, activities coordinator at Pelton Grange Care Home, is mum to one of the team’s players and invited the rest to participate in the cycling challenge. The summer fayre and cycling challenge raised almost £120 for the Alzheimer’s Society. Les Burnett, home manager, said: “I’m so proud of my team for beating the weather and creating a fabulous day for our residents, their families and our friends. The cycling challenge was in support of Wendy Waddicor, managing director of the Hill Care Group, which operates the care home. Wendy recently cycled over 340 miles from London to Paris to raise funds for the Alzheimer’s Society – raising almost £7,700 with the help of Hill Care’s homes across the north of England. She said: “It was great to see the residents, staff and visitors all taking part. I’m really grateful for the support. Further donations can be made through Wendy’s JustGiving page at www.justgiving.com/fundraising/wendy-waddicor.